On a planet where 71 percent of the surface is covered by water, the oceans are critical for life itself. They feed us, regulate our weather patterns, provide over half the oxygen that we breathe, and provide for our energy and economy. Yet only 5 to 10 percent of the ocean floor and the waters beneath the surface have been explored and mapped in a level of detail similar to what already exists for the dark side of the moon, for Mars, and for Venus. Our ability to measure change in the oceans is increasing because of improved measuring devices and scientific techniques, as well as new GIS technology. GIS technology, which has long provided effective solutions to the integration, visualization, and analysis of information about land, is now being similarly applied to oceans. Our ability to measure change in the oceans (including open ocean, nearshore, and coast) is increasing not only because of improved measuring devices and scientific techniques but also because new GIS technology is aiding us in better understanding this dynamic environment. This domain has progressed from applications that merely collect and display data to complex simulation, modeling, and the development of new research methods and concepts. As an organization with the mission to inspire and enable people to positively impact their future through a deeper, geographic understanding of the changing world around them, Esri recognizes that this understanding must involve a strong commitment to the oceans. 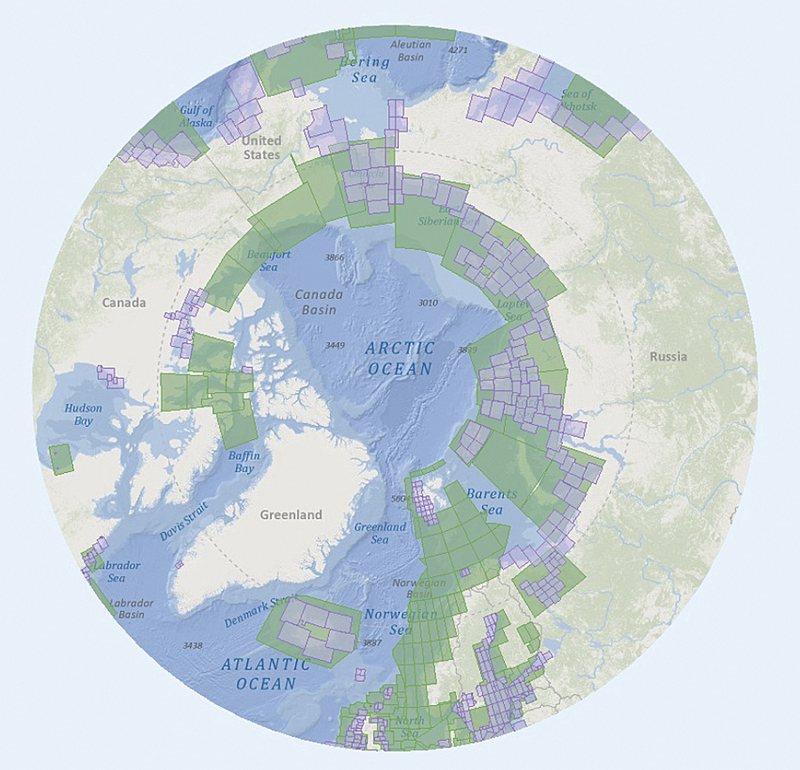 And that's why Esri recently launched a major Ocean GIS initiative across the entire company. The team supporting this initiative is composed of professional services staff, GIS software engineers, project managers, instructors, Partners, and many others. The Ocean GIS initiative has been motivated in great part by the need to provide effective mapping tools and techniques to respond to recent disasters such as the Deepwater Horizon oil spill in the Gulf of Mexico and the Tohoku-Oki earthquake and tsunami in Japan. It is also motivated by a sincere desire to assist in the implementation of the United States National Ocean Policy, particularly in the area of coastal and marine spatial planning, for which GIS provides a crucial decision support engine. As part of this initiative, Esri is expanding from an initial emphasis on nautical chart production and applications for commercial shipping, maritime defense/intelligence, and offshore energy (e.g., oil and gas, wind energy) to ocean science and resource management. Esri is pursuing a greater engagement with the ocean science community, as complex ocean science questions and data are increasingly used to inform the responsible use and governance of the oceans, as well as effective management and conservation. To support a better understanding of our oceans, Esri is focused on improving and expanding its products, tools, services, partnerships, and connections with the broader ocean community. Some of the initiatives being pursued toward this goal are outlined below. 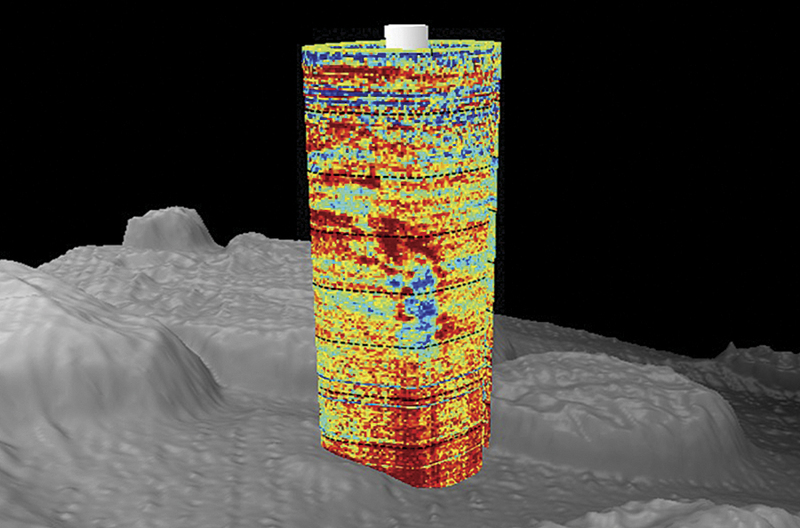 The water column over the Deepwater Horizon oil spill in the Gulf of Mexico showing acoustic backscatter data over the wellhead. The visualization was produced by the University of New Hampshire Center for Coastal and Ocean Mapping (UNH-CCOM)using the Fledermaus midwater mapping tool (courtesy of ccom.unh.edu/project/deepwater-horizon). Esri will continue to build the bathymetry data asset in the Ocean Basemap via crowdsourcing, with a continued strong emphasis on authoritative contributions from international hydrographic offices and scientific institutions. 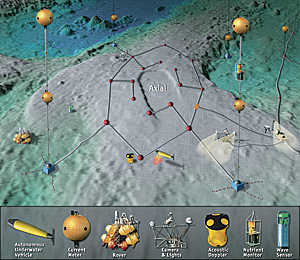 It will also explore and implement the provision of additional public domain content layers, such as existing nautical chart services with International Hydrographic Organization S-57 symbology, and global maritime boundaries, offshore energy infrastructure, sea surface temperature, salinity, sediment classifications, acoustic backscatter, and more. Esri will also continue to make progress on a version of the basemap without labels. Esri will expose the Ocean Basemap as part of the World Elevation Service, making it a truly integrated "land and ocean" elevation service. This includes building in the potential for raster analytics performed against the bathymetry and other valuable ways to expose the data. Esri's goal is to provide intelligent bathymetric services in the cloud by underpinning the Ocean Basemap with the power of ArcGIS for Maritime: Bathymetry and the bathymetric information system (BIS) therein. A BIS server would push out additional management functions for bathymetry, such as database rules to sequence and display data by highest resolution, acquisition date, and so forth, as well as have the benefit of faster performance. This capability would allow the Ocean Basemap to deploy, in the cloud, a truly worldwide model of bathymetry. The ArcGIS Resource Center has been reorganized and updated in conjunction with the release of ArcGIS 10.1, and final versions of an ArcGIS for Oceans and an ArcGIS for Maritime resource center are now completed. Work continues on populating these resource centers with additional content under the themes of Research and Exploration, Ocean Observation, Marine Ecosystems, Aquaculture and Fisheries, and Recreation and Adventure. The Ocean Basemap displayed in polar projection as part of an Esri Story Map. This shows the extent of the Arctic yet to be covered by nautical charts. The footprint of existing nautical charts is in green and purple. The Esri Oceans Summit, to be held November 7-8, 2012, is a primary means of advancing Esri's Ocean GIS initiative. This high-level strategy meeting will be attended by a select group of intermediate to advanced ocean GIS analysts and developers. A successful event will potentially lead to an annual Esri Oceans Summit, open to all users, which will serve further to establish an Esri oceans user community with a shared vision of advancing the implementation of GIS in ocean science and resource management. The Arc Marine data model, first published in a research monograph in 2007, has been widely adopted by agencies and organizations responsible for our oceans. It is still recognized as a valuable model, and its adoption appears to be ongoing, with a number of organizations seeking to standardize on Arc Marine. A new plan is being developed to implement the data model in the latest version of the Esri geodatabase (including the ability to use a file rather than just a personal geodatabase), as well as best practices to define a web service platform. It will be newly validated against use cases and cartographic and user requirements. A new tutorial will be prepared to incorporate a broader range of ocean datasets and possible workflows with the model. In collaboration with the National Oceanic and Atmospheric Administration, Scripps Institution of Oceanography, and the US Geological Survey, Esri is developing a series of vertical, time-dependent datum transformations to help researchers transform data between ellipsoidal, orthometric, and tidally referenced elevation data at the shoreline. This is absolutely critical for coastal surveying, coastal geomorphology, and coastal terrain models that connect nearshore bathymetry for terrestrial digital elevation models that are used for storm surge, hurricane, and tsunami inundation modeling. Satellites can clearly map the ocean surface, and acoustic sensors can map the ocean floor, but ocean scientists currently have a limited view of the water column between the ocean surface and the ocean floor. There is a critical need to study the internal structure of features in the water column, such as plumes (hydrothermal vent plumes and oil well plumes as in the Gulf of Mexico spill) or schools of fish to obtain fish stock dynamics, spawning grounds, seasonal habitats, and the impact of climate change on these. To exploit water column data, an efficient means of reading, processing, and analyzing the data is required. Esri is continually improving support for scientific spatial and temporal data formats, such as the climate forecast convention of the Network Common Data Form 4 (netCDF-4) data model and the closely related Hierarchical Data Format. In addition, Esri seeks to better articulate to users the rich palette of 3D representation that ArcGIS already contains, such as features, TINs, vectors, multipatches, and arrays. Esri will be adding more 3D analytics in the next generation of ArcGIS, enhancing all 3D representations to deal with the visualization and interpretation of scientific data, imagery features, point clouds, and arrays. This is particularly important in Esri's quest to improve software functionality for ocean and atmospheric GIS. Building a GIS platform that various kinds of numerical modelers could use to associate their efforts would provide a kind of geospatial fabric to interrelate the models. One of the most widely used models in the oceans space is the Regional Ocean Modeling System (ROMS), yet models such as ROMS pose great challenges for GIS, as they are often not uniformly spaced and may be composed of either unstructured triangles or structured curvilinear grids. There is a great need for tools to handle these grids in a more standardized way, allowing the possibility of standard access to data on the model's native grid. To address this important issue, Esri is investigating the use of netCDF Markup Language, an XML representation of netCDF metadata, which contains attributes that work effectively with the third dimension. For more information about Esri's Ocean GIS initiative, download the e-book.